20 January - It's time to give the ponds their own diary again. 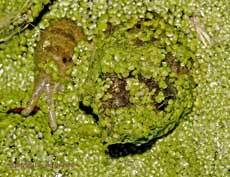 Over the Winter so far they have appeared, on the surface at least, to be quiet places, carpeted by a green blanket of duckweed. In fact, they appeared so inviting that a couple of weeks ago I was amused to see a Wood Pigeon attempt to land on the small one - it had quite a shock! 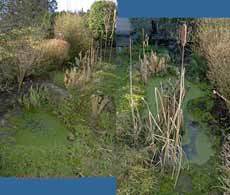 For those who haven't followed my previous pond diaries, we have two ponds, a small preformed one (seen in the foreground of the left-hand image) with a larger pond (about 12x5ft) which you can find out more about if you click on the 'Garden' button at the left of the screen. a narrow stone path permits access between them. The right hand image shows the big pond, with the western, shallow end in the foreground. 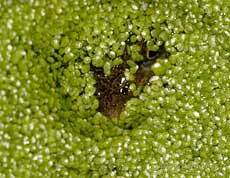 The clear area in the duckweed is caused by the Blackbirds and Sparrows as they bathe. This is also where the frogs produce the bulk of their spawn, and I spent time yesterday clearing some of the vegetation ready for spawning. This afternoon I have more or less completed the job, although a bit of tidying up might be needed once the water has cleared. The two reedmace seed-heads at the two ends of the pond have started to swell up and are getting close to bursting now. 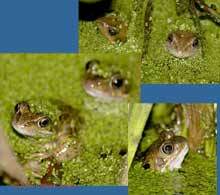 I've been able to see frogs in the pond on just about every night through the winter so far. Usually it was two or three, but in the last week there have been a few more, and last night I was able to count thirteen. The mild weather we have been experiencing (over 10C on the last two days) may be encouraging more of the frogs to become active as the water temperature exceeds 7C. Having said that, today is sunny, but a few degrees cooler, and I've just seen a weather forecast that suggests the weekend will be cold with frosts. This afternoon I'm spending much of my time watching the news channels as they cover the appearance in the Thames in Central London of a Northern Bottlenose Whale. Another one has been spotted at Southend, where the Thames meets the North Sea. This is the first time that a whale has been recorded in the Thames, and this one doesn't belong anywhere near the Thames, but should be in the deep waters of the North Atlantic or, perhaps, the Northern North Sea. It appears to be very distressed and although fascinating to watch, it's a very sad sight. Never having had to chance to see a whale, had it had been reported earlier I may well have packed camera bag and headed for London. 21 January - Yesterday I said that the Reedmace were near to bursting. Well, today I have to update that. 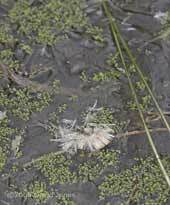 It looks as though a bird has pecked at the top of the seedhead at the far end of the pond. You can see in the right-hand image how the mass of seeds peels away from the central stem as a dense mat. Tthe 'missing' bit from the top is lying on the ground almost immediately below. A disappointing whale update - it was even further up the Thames this morning, and has since been caught and this evening was being carried out to the open sea on a barge in the hope that it could be released in deeper water. Sadly, as I write this the news has come through that it has died, the stress probably being simply too much for it - a sad end to two days of frantic efforts to return it to its normal environment. 23 January - The air temperature has dropped over the last two days, and the pond water is getting colder again. The night before last we had a slight frost, leaving a film of ice over the pond by the morning, but which disappeared quite quickly. Last night the temperature stayed above zero and at noon today both the air and water temperature is around 4C. It's another grey day, and the forecast is for the temperature falling to something like -5C tonight. With that in prospect, I've topped up both ponds this morning. 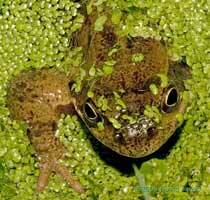 Needless to say, frog activity has been curtailed again, with only one sighted over the last two days. With the air very still, the Reedmace has shed very little more of its seeds. 24 January - A low of -2.5C last night meant that by this morning both ponds were completely frozen over, and they have remained so all day, and colder temperatures forecast for tonight will no doubt add to the thickness of the ice layer. 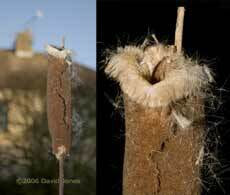 A little more of the reedmace seed mass has been shed today, but I still to see any bird going to it. 25 January - While it did drop down briefly to -2.7C last night, today the temperature rose back up enough to melt most of the ice on the ponds again. By lunchtime the Blackbird was able to bathe in the pond again, and tonight at 8pm I was able to spot two frogs peeping out from under the duckweed. This was the only one that I could get near to with the camera. 30 January - The last few days have seen temperatures hovering at less than 5C with some ice appearing on the pond each morning, except for today, after a minimum last night of over 2C. Frog activity has been almost halted, with just the occasional glimpse of a nose, but this e evening I've just counted four at 7pm, including this one which only gave away its position by exposing a leg! The Reedmace has stopped shedding seeds, despite the constant easterly breeze, which makes me feel certain now that the original release was due to the attentions of a bird.